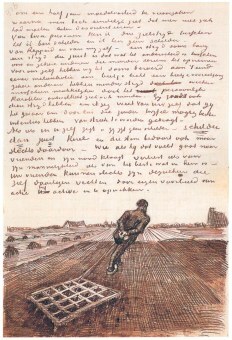 At the moment I’m reading a Van Gogh's biography, which has a detailed account of his life, thanks to the extensive letters Vincent would write to Theo - his ever patient and loyal brother. At some point of Vincent’s life, in his late thirties he moves to Paris, with Theo. The biographer’s frustration is almost palpable, because the brothers are living together and therefore, there’s no point in exchanging letters, so at the end of the day the biographer has no material to work with. Of course the biographer uses other sources, but there’s no psychological depiction of the painter, the source is cold and factual. There’s no passion, and as a reader I feel the account is one-dimensional – actually, I’m anxious to go on reading, to the later days when Vincent is not sharing the flat with Theo, so the narration gets more detailed and enthusiastic. Of course, Vincent’s (amazing) drawings and (breath taking) pictures illustrate part of his life, at least life as he saw and felt it. But the reasoning, the heartache, the vision that’s all in his excruciatingly detailed letters to Theo and some other people who, luckily for us and art students all over the world, have kept the letters. It seems intriguing to me that Theo would save all the letters, for a lifetime. In my tiny hall there’s a Chinese chest, half filled with letters I’ve received in the last 20 years. Even though the letters only tell half the story, similarly to what happens with Vincent, it tells my story: the people I’ve met, the places I’ve been, the experiences I’ve shared, the lessons I’ve learned. And around the world, if people have kept my letters and postcards, the other half of my story is scattered around. More, I feel that whenever I mail a letter (not an email, a letter of the old fashioned kind: on paper and written with a fountain pen) I’m chopping bits and pieces of my soul and sending them away. Something like “I’ve given birth to you , I’ve raised you and now you’re ready to depart and face the world. Off you go!”. However, the moment I mail the letter, I forget its contents. I’ll remember of course what was it about, but I cannot remember specifics. So, in the end, I’m left with an unfinished version of my story. Last year, of one my oldest and dearest friends turned 32 and I thought it would be funny for him to read the letters he wrote me when he was 16. I wrapped them and gave him as a birthday present. He was genuinely happy – he had been thinking for some years now, to organize his letters (the ones written to him). But then he felt there was not really a point, because it would be putting up together a dialogue with only one speaker. Now he had a chance to have the entire story, the dialogue of two voices, a bit of History – his story.